Fashion conscious Victoria Beckham, Rhianna, Kate Moss, and a host of stylish celebs have all been spotted wearing classy, understated and versatile swing earrings recently. Inspired by catwalk designer trends, this is the latest hot fashion look to add to your style savvy sterling silver jewellery and accessories collection. The striking dainty, under lobe pieces sparkle and shimmer as they caress and dangle below the front and back of your earlobe, enhancing your features with each gentle movement. Under lobe Triangle and on-ear Disc swing earrings in 14ct rose gold vermeil and radiant cubic zirconia pave'. The under lobe triangle ear jacket balances the disc stud beautifully and gives an edgy, on trend look for both evening and day wear. Rose gold vermeil curved bar swing stud earrings are a contemporary take on the classic ear studs. 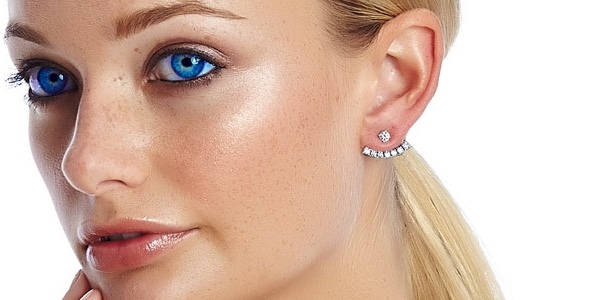 A single CZ crystal sits on your ear, seven crystals swing under your earlobe creating an on-trend, modern look. Stunning under the lobe earrings consist of a traditional stud plus a swinging feature that dangles below the earlobe. Many feature four holes on the disc stud so that movement and swing of the exquisite suspended piece can be adjusted. 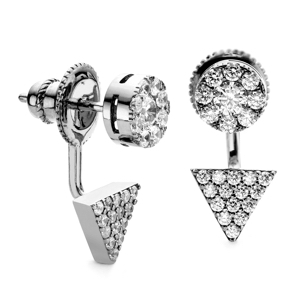 Under lobe earrings can be easily adapted to enhance your outfit. Wear these reinvented classic stud earrings complete with curved swing piece for a glamorous and sophisticated statement look. Or, simply remove the swinging dangle to wear the studs alone. The delicate balance of these gems adds eye-catching sparkle and contemporary glamour to any outfit. The subtle movement of the curved dangle illuminates your complexion, flatters the jawline and highlights your best features. Wear these elegant feminine ear jewels if you want to elevate your unique personal style without too much fuss. Choosing a perfect pair is easy, once you consider your specific needs. Hair Style And Length Short bobs and pixie cuts are instantly glammed up by the addition of dainty twinkling earrings that draw attention to the jawline and complexion. Longer hair that is swept off the face into a stylish updo or chignon, also suits sophisticated shimmering gemstone-paved styles. Avoid wearing long hair loose if you want to show off this modern on trend style. Clothes And Personal Style Always consider your outfit when choosing ear art. Ear Swings create a stylish polished look that is suitable for work and play, and beautifully finishes off any ensemble. Pair them in sterling silver finish with smart work attire or add a touch of sophisticated dazzle to a casual outfit. These versatile on trend earrings are understated, eye-catching and perfect for everyday wear. Trends And Timeless Fashion Whilst jewellery trends may come and go classic statement pieces never go out of fashion. Choosing elegant and beautiful under lobe to update your accessory collection, is a great way to flaunt your personal style. 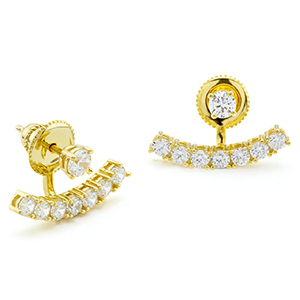 The versatile stylish pieces can be worn as traditional studs or as statement earrings for instant glam celeb style. Choose high quality pieces as an investment purchase that effortlessly elevates your on trend look. Hypoallergenic Earrings If you have sensitive skin always check that your earrings are made from hypoallergenic metals, like sterling silver, gold vermeil and white or black rhodium.